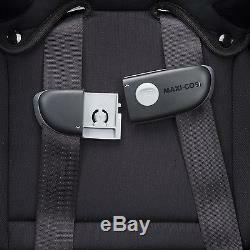 New Maxi-Cosi Pria 85 Max Convertible Car Seat Child Safety Air Protect Night Black. Enjoy the ride with your new BFF. Face the world in style with these fashions inspired by those who want to explore the world around them. The Pria 85 Max lets you enjoy the ride with your new BFF. Its the only premium convertible car seat that offers a first-class ride from 5-85 pounds and premium innovations that make it easier to get your child in and out of the seat. The ClipQuik auto-magnetic chest clip opens easily from the front side with just one hand when getting your child out of the car. Strapping them back in again is easy too. The ClipQuik magnets slide together and lock on their own so you can get on your way quickly. Its also easier to get your child in and out of the Pria 85 Max thanks to the handy harness holders that keep the harness straps out of the way, and a flip away buckle. This clever buckle wont get stuck under your baby when getting in the seat or stuck in clothing when getting out. The Pria 85 Max convertible car seat fits children rear-facing starting at 5 pounds with removable insert cushions to give smaller babies a snug fit. It then keeps them cozy up to 40 pounds. When they're ready to ride forward-facing, turn this car seat around to safely fit children up to 85 pounds; the highest weight range offered by a convertible car seat. Both stages benefit from the safer side impact protection provided by Air Protect® technology which protects your child where its needed most, around the head. Featuring insert cushions and premium fabrics and padding throughout, the Pria 85 Max also provides the most comfort for your child during the journey. It provides more comfort adults too with a special design that fits better in your car, allowing more room for your passengers to stretch out in the front seats. Keeping the Pria 85 Max clean is simple. The seat pad unsnaps and removes easily over the frame. 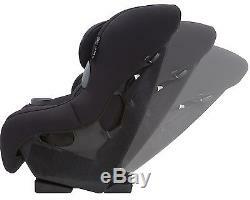 Theres no need to remove the seat from the car or to make complicated maneuvers with the harness straps. 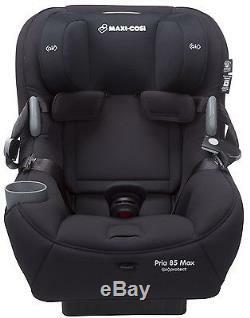 The Pria 85 Max seat pad is both machine washable and dryer safe. 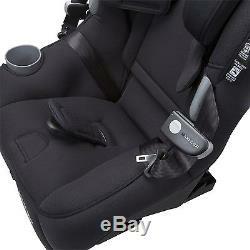 All this allows you to get a thorough clean not available in other car seats. Not including combination harness to booster seats. 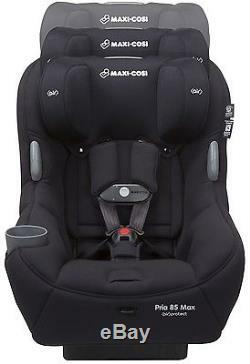 Extended weight range keeps children safely harnessed longer: 5-40 pounds rear facing and 22-85 pounds forward-facing. ClipQuik auto-magnetic chest clip gets you on your way quickly. Handy harness holders keep harness straps out of the way for easy boarding. Flip Away Buckle wont get in the way while getting in and out of the seat. Safer side impact protection thanks to Air Protect®: Advanced air cushion system protects your childs head where its needed most in a side impact crash. 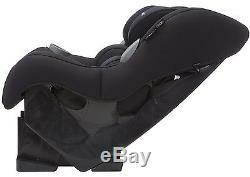 Two removable inserts keep smaller babies snug and secure. FlexTech system for multi-directional energy management. Perfect Fit one-hand harness height adjustment with micro-adjustments for a customized fit and better safety. Not just easy to clean, the EASIEST! 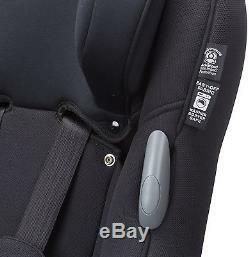 The seat pad and harness covers are removable with simple snaps, and there's never a need to uninstall the seat or rethread the harness to get the pad on and off. 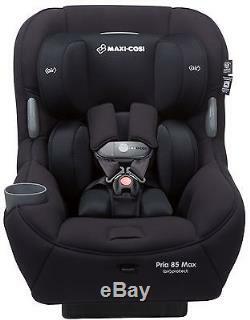 The Pria 85 Max seat pad and harness covers are both machine washable & dryer safe. 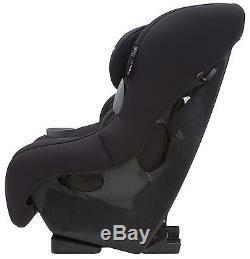 Premium fabrics and padding provide the most comfort for child. Deep rear-facing adjustment, making it easier and faster to correctly install rear-facing. Integrated gripping cup holder securely holds drink during the ride. 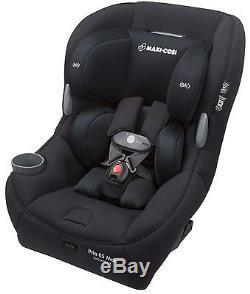 The item "Maxi-Cosi Pria 85 Max Convertible Car Seat Child Safety Air Protect Night Black" is in sale since Friday, October 6, 2017. 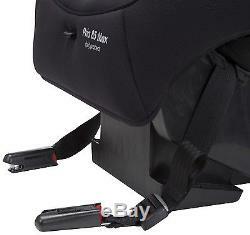 This item is in the category "Baby\Carriers, Slings & Backpacks". The seller is "devinesuperstore" and is located in Cerritos, California. This item can be shipped to United States, Canada, United Kingdom, Denmark, Romania, Slovakia, Bulgaria, Czech republic, Finland, Hungary, Latvia, Lithuania, Malta, Estonia, Australia, Greece, Portugal, Cyprus, Slovenia, Japan, China, Sweden, South Korea, Indonesia, Taiwan, South africa, Thailand, Belgium, France, Hong Kong, Ireland, Netherlands, Poland, Spain, Italy, Germany, Austria, Bahamas, Israel, Mexico, New Zealand, Philippines, Singapore, Switzerland, Norway, Saudi arabia, Ukraine, United arab emirates, Qatar, Kuwait, Bahrain, Croatia, Malaysia, Brazil, Chile, Colombia, Costa rica, Panama, Trinidad and tobago, Guatemala, Honduras, Jamaica, Antigua and barbuda, Aruba, Belize, Dominica, Grenada, Saint kitts and nevis, Saint lucia, Montserrat, Turks and caicos islands, Barbados, Bangladesh, Bermuda, Brunei darussalam, Ecuador, Egypt, French guiana, Guernsey, Gibraltar, Guadeloupe, Iceland, Jersey, Jordan, Cambodia, Cayman islands, Liechtenstein, Luxembourg, Monaco, Macao, Martinique, Maldives, Nicaragua, Oman, Peru, Paraguay, Reunion, Viet nam.